Wood stoves are highly efficient, environmentally responsible, convenient and affordable – everything you want when keeping your family warm. Whether you’re looking for a stove to complement your décor or to bolster your budget – the Wood Stove Finder can help you make an informed decision and find the wood burning appliance that’s right for you. 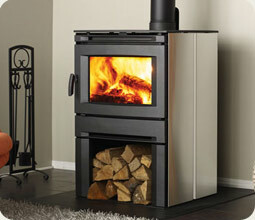 The striking design of the Alterra CS2400 contemporary wood stove puts the focus on the brilliant glowing fire. With an impressive 20% greater viewing area than traditional wood stoves, and a handy fire-wood storage area at its base, the CS2400 is perfectly proportioned for visual pleasure and functional convenience.